Louvre Abu Dhabi, an art and civilization museum, will launch the second edition of its globally acclaimed Highway Gallery returns from April 7, a media report said. Ten new artworks from Louvre Abu Dhabi’s collection, reproduced as giant 3D sculptures or 10-metre high billboards, will appear alongside the E11 Sheikh Zayed Road from Dubai to Abu Dhabi, reported Emirates news agency Wam. As drivers tune into one of the partner radio stations and approach the display, they will automatically hear a 30-second story about each artwork as part of a collaboration with Abu Dhabi Media via Radio 1 FM (100.5FM), Classic FM (91.6 FM) and Emarat FM (95.8 FM). 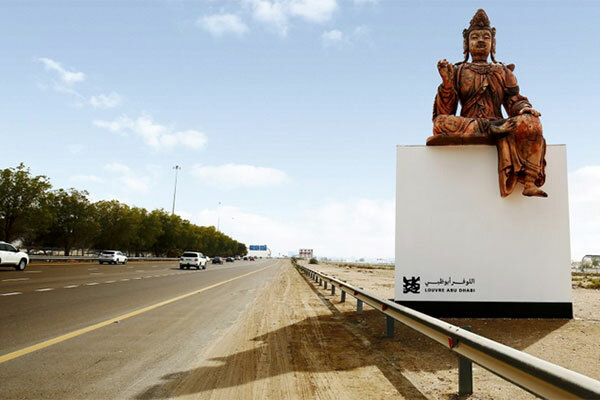 The campaign offers visitors a comprehensive experience of discovering art, beginning on the road on their way to the museum, and continuing inside Louvre Abu Dhabi via a dedicated tour around the Highway Gallery in the museum’s multimedia guide, featuring video interviews with seven of the participating influencers. The 2019 edition of the project also features several new elements. Three of the ten masterpieces will, for the first time, be reproduced as three-dimensional sculptures. In addition, a select group of renowned personalities that represent the multicultural voices of the UAE have recorded the script for each artwork. Reflecting Louvre Abu Dhabi’s universal narrative, Highway Gallery 2.0 will include works from different moments of history and a variety of cultures, including ancient masterpieces such a vase from circa 5500 BCE, found on the UAE island of Marawah; a 4,000-year-old statuette of an ancient Bactrian Princess; as well as a 11th or 12th century statue from China representing Guanyin, a divinity of compassion. Other historic artefacts include a 15th century Islamic helmet, a 17th-century Hindu manuscript depicting a huntress, and a Japanese suit of armour from the early 18th century. The 19th century is represented with James Abbott McNeill Whistler’s Arrangement in Grey and Black N˚1 (1871), Edouard Manet’s The Bohemian (1867) and Vincent Van Gogh’s The Dance Hall in Arles (1888), alongside a surrealist work by 20th century painter Joan Miró. Mohamed Khalifa Al Mubarak, chairman of the Department of Culture and Tourism – Abu Dhabi, said: "The Highway Gallery is a flagship project for both the UAE and the international museum landscape, being the first initiative of its kind. Last year’s launch was hugely successful and reaffirmed Louvre Abu Dhabi’s position as a global cultural innovator. “Now it returns, to once again offer a pioneering way to engage residents and visitors alike with the museum’s collection, outside of its walls. The Highway Gallery is a prime example of our efforts to make art and culture an integral part of everyday life in the UAE, further enriching the lives of those who reside, work, and visit here. As the UAE celebrates the Year of Tolerance in 2019, we see the Highway Gallery as an extension of Louvre Abu Dhabi’s physical galleries, bringing its universal collection of works from different geographies and cultures, and its celebration of humanity, to the widest possible audience." Manuel Rabate, director of Louvre Abu Dhabi added: "The vision of Highway Gallery was always to take Louvre Abu Dhabi’s art works to our public in their everyday lives. With the Highway Gallery 2.0, our collection is brought to life by prominent voices from the UAE telling you the history of these artworks and their hidden stories. I encourage people to visit the museum to see these art works in person, to experience our world-class architecture or our diverse programme of exhibitions, family weekends and Ramadan and summer initiatives, offering something for everyone." The museum will include a Highway Gallery tour in its multimedia guide, featuring video interviews with the influencers participating in the campaign. The tour will be available in English, Arabic and French. Visitors can rent the guides at the museum during their visits, or they can download the tour onto their own devices through the Louvre Abu Dhabi App which is available in the App Store and on Google Play.